Punxsutawney Phil seems to have gotten it right this year. He saw his shadow on Groundhog Day, and an early spring is nowhere to be seen in my neck of the woods. In Atlanta, February can bring the occasional spring day in the 60s or 70s. Daffodils begin poking their heads through the soil and the forsythia bursts into a wash of yellow. Well, that’s not happening this year. We’ve had nothing but cold, rainy days for weeks, and I’ve had enough. I thrive on sunny days. My thin blood is capable of handling only so much cold weather. So with nothing but cold days in the forecast, I’m staying in soup mode until that first warm day comes along. During the winter months, I never tire of a warm bowl of something delicious. I’ve had corn chowder on my to-do list since the summer, and for today’s post I’ve finally gotten around to making it. We’re fortunate enough to have access to delicious fresh corn throughout the winter, so I picked some up at the farmer’s market over the weekend. Of course if you don’t have access to fresh corn, frozen kernels will work fine for this recipe. 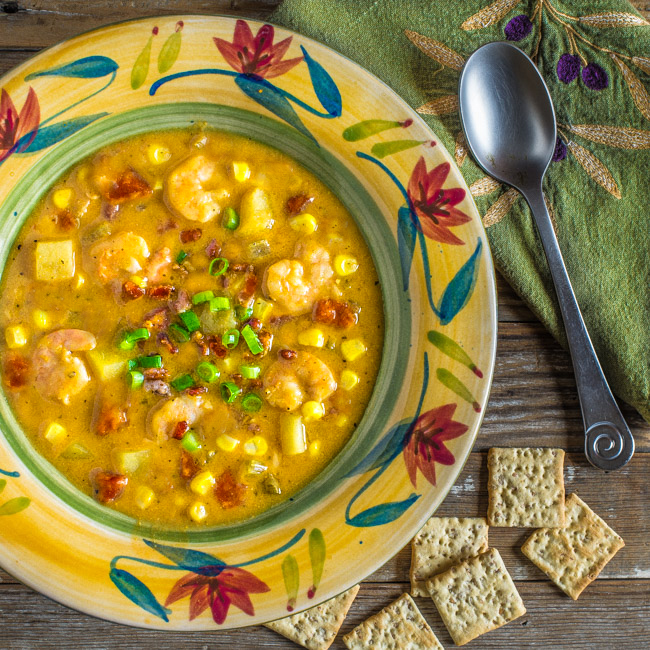 Corn chowder is a great starter for dinner, but the addition of shrimp and a bacon garnish made this version a complete meal. All we needed was a few whole grain crackers and dinner was complete. I realize that I’m a bit of a wimp when it comes to cold weather. Some areas of the country have had feet of snow and consistent sub-freezing temperatures this year, so who am I to complain? As long as I can have this shrimp and corn chowder, I’ll keep my mouth shut and hope for spring. 1. In a large Dutch oven or soup pot, brown bacon. Remove from grease, drain, and set aside. Transfer onion, celery, and garlic to pot and saute for 3 to 4 minutes. Add potatoes and corn and continue cooking for 4 to 5 minutes, stirring regularly. 2. Add chicken stock, tomatoes, salt, pepper, and basil to pot and bring to a boil. Reduce heat, cover, and simmer for 15 to 20 minutes until potatoes are tender. Transfer half of the mixture to a blender or the bowl of a food processor and process until smooth. Return to pot. 3. Add shrimp and cream and simmer for 3 to 4 minutes until shrimp are done. Adjust salt and pepper if needed. 4. Ladle soup into bowls and garnish with reserved bacon and scallions. Wow, Greg! Such good taste in dishes you have!